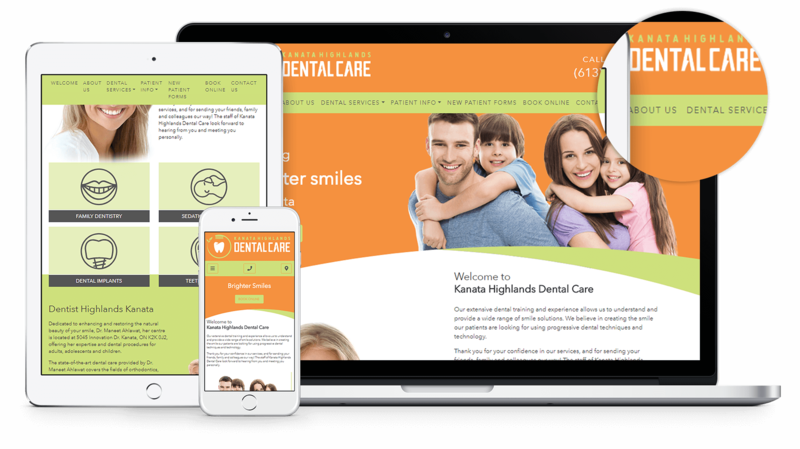 Kanata Highlands Dental Care near Ottawa, Ontario recently chose us to create a fresh, new website to showcase their practice. The design of this new website features a bright, fun, citrus inspired colour palette, a new logo with a touch of whimsy, and a fully responsive design which showcases some great transitional design elements across devices - such as link boxes featuring graphics on full screen showcasing photos on mobile screens. To create a seamlessly integrated patient intake system, we also incorporated a paperless form system so patients are able to submit their information online or on device in the waiting room - saving the practice a lot of time that would otherwise be spent handling, filing, and storing paper forms. Kanata Highlands Dental Care also features a virtual office tour - showcasing the sleek, modern, fresh practice, a patient question submission page, and an online appointment booking system. The website is highly SEO friendly as well, helping the practice to begin ranking well in search results quickly.